That was Bobby Petrino, when he was introduced, less than a year ago, as the new Atlanta Falcons head coach. Yesterday, after going 3 and 10 as a head coach there, he quit the best job in the NFL. And the reason he quit is simple. 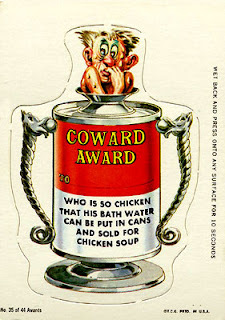 He is a coward. This is Petrino on the day of his hiring: "I think the No. 1 thing that drew my interest was Rich [McKay] (the GM) being here...It was an easy decision for me." Yeah....right. It wasn't working with Michael Vick. It was the "working relationship with a GM". That's why like, 16 seconds after Vick gets thrown into the pokey for two years, you resigned for the college football hotbed of Fayetteville, Arkansas. 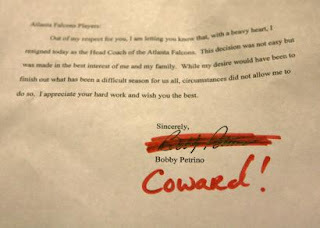 Aside from all the double-talk, how "hard" it was for him to leave Atlanta, and how it was the best decision for his family crapola, the truth is plain: Bobby Petrino didn’t think he was up to coaching the Atlanta Falcons. Let's look at from poor Bobby's point of view. Instead of coaching the talented, but erratic Michael Vick (or Matt Schaub) your choices now at quarterback are Joey Harrington, the forever-broken Byron Leftwich and Chris "I was selling insurance 6 months ago" Redman. The best player on your defense, Patrick Kearney from last year has 13 1/2 sacks, which leads the league. Too bad those sacks are for Seattle, where he plays now, and your defense is 24th in the league and DeAngelo Hall is openly saying he wants to be elsewhere next year. So, when the coaching situation in Atlanta got tougher than you thought it was gonna be, what do you do, Bobby? You thought, I'm not up for this. But tough luck, because men honor their contracts. No matter what turn of events, no matter how they may dread it inside. They do what they say they're gonna do. Right? Wrong. Remember, you are a coward. So, this is what you do, as a coward. You assure the Falcons owner Arthur Blank on Monday afternoon you would be back in 2008 to coach the Falcons. And then the next day, you call anyplace that will have you—in this case, the football legacy that are the Arkansas Razorbacks—and ask them about coaching there. You hold a press conference at 10:45pm saying you can't wait to coach at the "A", and to your old players, you write a 4 sentence note. It was hung in each of their lockers. You don't speak to one of them personally. It's beyond me you are ever are gonna get a recruit, how any kid would wanna be coached by you. Because the evidence says, not only are you a bald-faced liar, but the minute things turn rough, you run away. All a recruit has to think is: "This guy had 'The best job in the NFL' and ran away, like a coward." And who the heck would ever want to be coached by a coward? I agree that he bailed quickly and he was less than forthcoming with the Falcons, but let me offer something up in Petrino's defense. I have heard over the year that the players thought he was too hard on them. I believe "D Hall" was one of the most vocal players on the subject. Petrino, like many other coaches who come from college to the pros (Pitino and Calipari are two examples), have a problem adjusting to an environment where you have to defer to your players. Players in all pro sports have to be handled with kid gloves because they have the ability, especially when they are a franchise-type player, to run a coach out of town. The word on Petrino was that he was a little over the top with his criticism and the players ran right to the media. While Petrino displayed a lack of class in sneaking out of town like the Colts did in Baltimore, part of me doesn't blame him. He may have seen the writing on the wall and wanted to be the one to make the move while he was still holding a decent hand. Pete, that might wash with me, but Petrino has a habit of doing this. Outside of the 4 seasons at Louisville, he has never coached at the same place for more than 2 years I think. He is always looking for that next step up. He will probably bolt from Arkansas as soon as a "better" job is offered to him. Regardless of his contract. Plus, I don't care what his reasons are. To leave during the middle of the season is pretty damn sorry. I get that he may have had players who didn't like his style. Hell, I'm sure of it. But that doesn't excuse his behavior. You tell Blank that you're staying, then call Arkansas to ask if the job is available. The heck with that. All I'm saying is the guy was in a situation where his star QB tortured dogs and his other stars (D Hall and Alge Crumpler) showed support for, and violated league policy by going out of uniform "in honor" of Michael Vick. I'm not convinced that the situation wasn't untenable for Petrino and I think it would have been more cowardly to stay there and coach that sick bunch of animals and take the money. He had a built in excuse for mediocrity for a couple of years. Supporting a guy who tortures innocent dogs? Would you want to coach them? Are you kidding?